What—editors have grammar and style peeves? Emmy Favilla from BuzzFeed asked ACES2015 attendees to write down their editing peeves as they relate to grammar or usage and used them to create a whiteboard post. As you may suspect, she had an eager audience. Even I made it on there. H.W. Fowler divided the English-speaking world into five classes: (1) those who neither know nor care what a split infinitive is; (2) those who do not know, but care very much; (3) those who know and condemn; (4) those who know and approve; and (5) those who know and distinguish. It is this last class to which, if we have a good ear, we should aspire. I suppose I should step back. What are infinitives? Infinitives are verb forms commonly used in conjunction with the word “to” or another auxillary verb (e.g., to go, can go, to examine). They can assume characteristics of nouns and verbs, and form phrases in association with objects and modifiers. These phrases can work as nouns, adjectives, or adverbs in a sentence. She needs to go to the store. I offered a solution to solve world hunger. They are taking a class to understand the complexities of grammar. 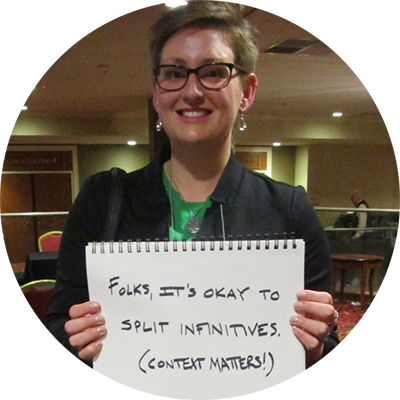 Splitting an infinitive is when you jam something—usually an adverb—between the two parts of the verb. She needs to quickly go to the store. I offered a solution to comprehensively solve world hunger. They are taking a class to better understand the complexities of grammar. If we changed the second sentence to “I comprehensively offered a solution to solve world hunger,” we’ve altered the meaning of the sentence. In the original, the solution will completely solve world hunger. In the second, we imagine the speaker offered a solution to a global crisis in a thorough fashion. Consider euphony: Does the sentence with (or without) the split infinitive sound pleasing to your ear? The last thing you want to do is write or edit in a way that trips up your reader. Your audience demands clarity. …CMOS has not, since the thirteen edition (1983), frowned on the split infinitive. The sixteenth edition suggests, to take one example, allowing split infinitives when an intervening adverb is used for emphasis (see paragraphs 5.106 and 5.168). In this day and age, it seems, an injunction against splitting infinitives is one of those shibboleths whose only reason for survival is to give increased meaning to the lives of those who can both identify by name a discrete grammatical, syntactic, or orthographic entity and notice when that entity has been somehow besmirched. Feel free to boldly go, friends. Picture courtesy of Emmy Favilla and BuzzFeed. On March 4, word nerds, grammar gurus, and language artists collectively brandish their red pens to celebrate National Grammar Day. I like to see these examples as grammatical merriment at a rule’s expense. I’m old enough that my grade school curricula included black-and-white grammar lessons and extensive sentence diagramming. We learned that you never end a sentence with a preposition, split an infinitive, use “they” in a singular context, or write in passive voice (unless, of course, you were taking any sufficiently advanced science classes, wherein all case studies adopted a third-person, passive approach). I get it—children require hard and fast rules to eliminate confusion and encourage growth. Too many exceptions can muddy the waters. But that’s not life. Sometimes the grammatically correct option sounds wrong and risks alienating a reader (or client). Editors are not gatekeepers to arcane realms of language—we’re crafters who shape words for intent, value, and audience. The hard-nosed, dog-whistle teachers and editors who clamor about esoteric errors fail to acknowledge that most readers really don’t care (nor should they). Grammar exists to assist clarity and help articulate a message, but our English is hardly standard. Language evolves. 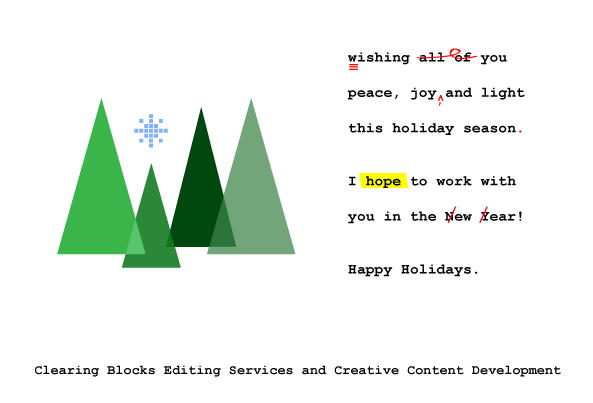 I love this, precisely because it illustrates the type of editor I’m working hard to become: one who celebrates, rather than polices, the evolution of the written word. Regardless of what you do or do not celebrate, be well. Don't forget that discounted NaNoWriMo packages expire on December 31. I love the idea of National Novel Writing Month. It’s an excuse to chase ideas and leverage oneself into a consistent writing practice. It’s a supportive (and sometimes competitive) community that offers on and offline resources to hobbyists and professionals. NaNoWriMo recognizes that cranking out wordage is crucial for producing a workable first draft, and it rewards and motivates you with badges, trinkets, and e-mails. If we’re really honest, sometimes that’s necessary. Regardless of whether you write 11,000 words or 50,000* words, writing is happening. And the best part? Readers can’t tell the difference between a well-crafted novel written in one month, six months, or six years. The key is quality, and that’s where I step in. I’ll read your manuscript and provide you with a reader’s report detailing overall strengths and weaknesses. (Excellent for unfinished stories and those lacking direction. Let me be your compass!) This report also will contain suggestions tailored to your story. Expect honesty! No marks will be made on your manuscript. I’ll analyze your characters and provide concrete suggestions to improve your story’s structure or arc, and chances are good that I’ll ask a plethora of questions. After you’ve rewritten your manuscript to your satisfaction, we’ll discuss a schedule for completing a detailed copy edit. This comprehensive review will include recasting, rewriting, and reorganization, as well as strengthening dialogue, improving word choice, eliminating clichés, and flagging inconsistencies. You’ll end up with an awesome manuscript filled with comments and suggestions, ready for your final revisions. All of the above. Once you’ve worked through the developmental and copy editing processes, killed your darlings, and dragged your manuscript through glass, we’ll move to pre-publication edits. I’ll examine your manuscript to check for typos or other errors that may have been missed or introduced during revisions. You can send me your final manuscript as a Word document, eBook, or PDF. If you choose to send an eBook or PDF, this proofreading phase will also review formatting and layout. These packages come with my ongoing support and are only available until December 31. Contact me as soon as possible if you’d like a sample edit, and know that I’ll be happy to make package adjustments based on your needs. Back to the word mines, wrimos! *Please note that if your novel is (a lot) longer than 50,000 words, I may need to modify pricing. Have you ever encountered a work rule so ridiculous, arbitrary, and inflexible that you want to shoot yourself or someone else into the sun at the earliest opportunity? Me too. But before you start crafting your solar cannons, put down your spanners and reassess: what’s the genesis of the offending rule? In some circumstances, hard and fast rules are created to prevent mortal peril. (So please, put your helmet back on). Other rules prescribe against economic peril, wherein an old, faulty process may have cost your company clients or cash. Still others guarantee a specific sort of orthodoxy; they may not make sense in every situation, but they’ve had the effect of keeping things moving forward in a uniform fashion. You get the idea. Sentences with more than twenty-six words can and should occur. Style and grammar rules will occasionally be subverted for the betterment of a narrative. That’s okay. Our rules exist as beacons to light our path and illuminate the monsters; we’re still free to trail our pens through the gloaming. Like many children of the 1980s, I grew up playing Nintendo. I started out with a small stack of mother-approved game cartridges that included Excitebike, Super Mario Bros., Final Fantasy, and Tetris. If left to my own devices, I'd spend hours parked in front of the TV until inevitably, my mother would appear and shoo me outside. 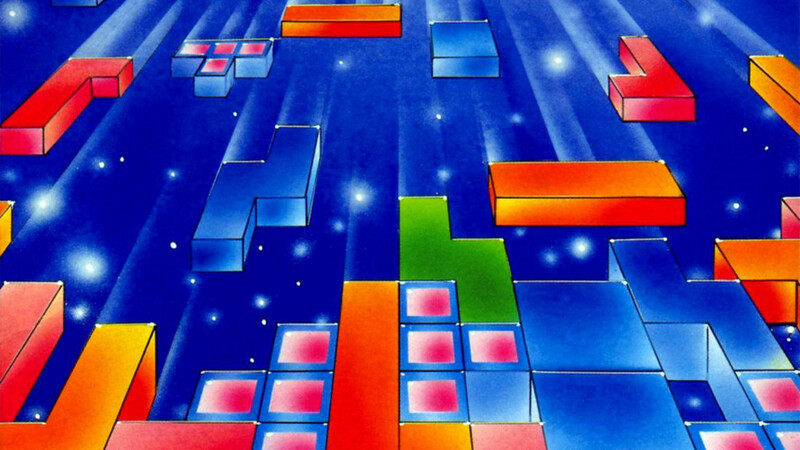 I was particularly drawn to Tetris and its hypnoptic 8-bit music. If you're not familiar with the game (or one of the myriad iterations it's spawned), Tetris is a puzzle game operating on a 2D plane in which a random sequence of Tetriminos (tiles composed of four square blocks) falls from the sky. These tiles can be rotated so that they fit together, allowing you to create a solid line of blocks without any gaps. The solid lines of blocks then disappear, giving you more room to work. The more lines you're able to clear at once, the more points you're able to obtain. As each level progresses, the tiles fall faster and faster, making it more difficult to organize and far easier to fail. Once your stack of tiles hits the top of the screen, your game is over. Even as a child, I was good at Tetris. I was able to watch the entire screen, note the shape of the tile slated to fall next, and plan for its entry into my assemblage. I optimized line clearing, setting up entire blocks that could only be cleared with the highly-sought after "I" tile of a quick, last-minute rotation of a "J" or "L" tile. When I'd eventually become confounded by blocks that fell so quickly as to be impossible to rotate without a fast-twitch tremor, I'd calmly push the power button and restart the game. I relished putting everything into the space where it'd best fit. I still play Tetris every once in a while, and I still play well enough that my gamer husband is suitably impressed by my skill. I like to think that my ability to patiently clear blocks has wide-ranging applications, both in writing and in editing. I curate work in much the same way as I arrange my Tetriminos: thoughtfully and efficiently, and with a keen mindfulness toward effective organization. My goal is to help others clear their own blocks and maximize their creative potential.